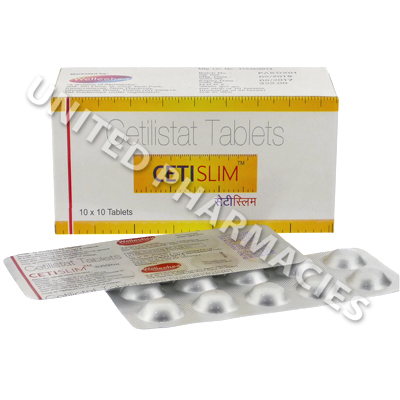 Cetislim (Cetilistat) is used to promote weight loss by inhibiting the enzyme called pancreatic lipase. This enzyme is secreted by the pancreas and normally acts inside the intestine where it helps to breakdown fat and triglycerides. This results in a significantly reduced amount of free fatty acids and fats being absorbed into body, especially after fatty foods have been consumed. Cetislim (Cetilistat) is an anti-obesitiy medicine which helps promote weight loss by inhibiting the enzyme called pancreatic lipase. This enzyme is secreted by the pancreas and normally acts inside the intestine where it helps to breakdown fat and triglycerides. By preventing the activity of this enzyme, the hydrolysis of triglycerides (types of bad fats) is partially prevented. This results in a significantly reduced amount of free fatty acids and fats being absorbed into body, especially after fatty foods have been consumed. Any remaining undigested fat is unable to be absorbed and is instead eliminated from the body as faeces. Treatment can help to lessen visceral fat and bodyweight, however patients should note that the use of medication to treat obesity needs to be accompanied by dieting, exercise and other lifestyle changes. This will help to minimize the risk of developing chronic diseases associated with being overweight, such as type 2 diabetes. Cetislim (Cetilistat) comes in capsule form and the medicine content of each one is 60mg. Go to see your doctor before using this medicine for advice on weight management and so that the right dosage can be calculated. The capsules are taken by mouth and swallowed whole with a full glass of water. Patients are generally told to take it with a meal so that it can prevent any fats consumed from being absorbed. In all cases, patients must strictly comply with the dosage regimen provided by their doctor and ensure that the maximum dosage is never exceeded as doing so could increase the risk of side effects. You must inform the doctor in charge of treatment if any side effects occur. Although less common, serious reactions are possible. Get medical help immediately if this happens. This medicine might affect the absorption of certain fat soluble vitamins as well as some types of nutrients. Consuming lots of foods with a high fat content may increase the risk of side effects. Always use Cetislim (Cetilistat) as you have been prescribed by your doctor. Never self-medicate or change your dosage without first consulting your doctor. The correct dosage can vary depending on your health, medical history, and the severity of the condition being treated.